A charging double top ten finish in race three from Honda duo Matt Neal and Dan Cammish ensured a positive conclusion for Halfords Yuasa Racing at Silverstone during Rounds 25/26/27 of the Dunlop MSA British Touring Car Championship, as Cammish successfully secured the coveted Jack Sears Trophy in his rookie season. 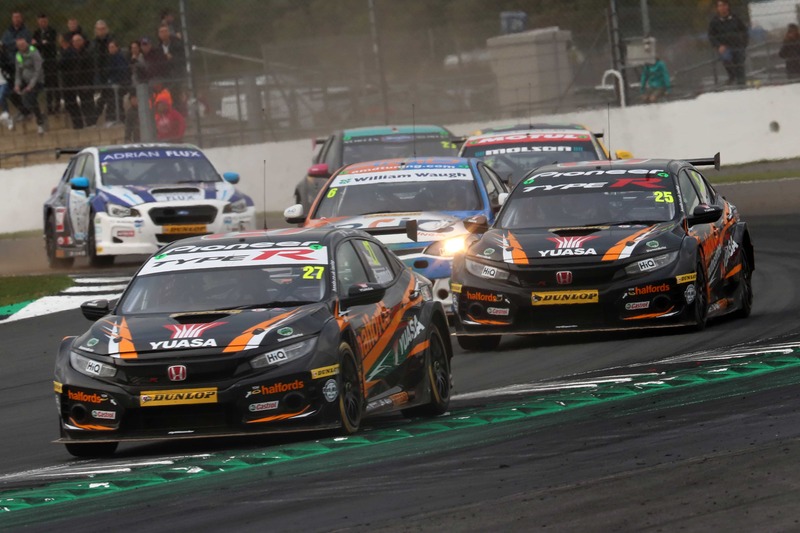 With the BTCC’s traditionally tight margins in evidence once more during qualifying around the 2.638km National configuration of the iconic venue, Neal and Cammish had given the Team Dynamics-backed Honda squad reason to be positive of a podium challenge after claiming sixth and 11th on the grid respectively. However, Neal’s hopes of Silverstone silverware in any of the three races were all but scuppered just two laps into the first encounter of the day when he was innocently collected by a wayward rival spinning into the path of his Honda Civic Type-R (FK8) at Becketts. Consigned to the garage after suffering terminal rear suspension damage, with Neal’s race two grid position reflected in his early retirement from race one he was forced to push forward from a lowly 29th on the grid. Undeterred, Neal demonstrated sheer determination to scythe his way back to the points in 14th. It was momentum Neal proceeded to carry through into the final outing of the day, the three-time champion suggesting what could have been with the benefit of better fortune by clawing his way back into contention for a hard-fought seventh place, a mere three seconds from the win. Cammish, meanwhile, progressed from the sixth row of the grid to secure tenth place in a tightly-contested first race of the day before a battling performance using the mandatory hard tyres saw him take the chequered flag in 15th during race two. Like Neal though, Cammish saved his best for last as the pair worked together to make gains through the order with the rookie racer following his team-mate home in eighth position. His triple-scoring efforts mean Cammish is the winner of the illustrious Jack Sears Trophy for 2018. Named in honour of the series’ inaugural champion in 1958 and eligible to drivers who began the season having never achieved a BTCC podium, Cammish quickly established himself as the driver to beat by stepping on the rostrum as early as round two, a feat he’d repeat on three further occasions. In the overall drivers’ standings, Neal holds down ninth position with Cammish in 11th position, with Honda consolidating second in the manufacturers’ championship and Halfords Yuasa Racing sitting third in the teams’ classification. To stay up to date – keep checking our News page, or Facebook and Twitter.